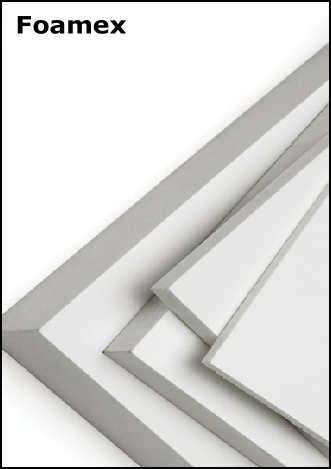 Foamex is a brand name for PVC foam sheet (or foam PVC). It’s a fairly dense material with a smooth finish, available in 3mm and 5mm thickness. outdoor conditions unless fixed to another board. These qualities have made it extremely popular for signs and display boards. 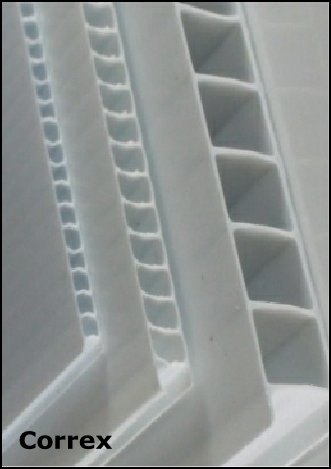 Correx is a brand name for fluted plastic board, or corrugated polypropylene sheet. It’s a very lightweight material and is the cheapest form of rigid signage.  to bending along the flutes when subject to high winds. Self Adhesive Vinyl - Mounted to Foamex or Correx included in the prices below. Available in gloss or matt finish. *Below are a few price options for our signs and boards with mounted vinyl graphics, but please email or call for your specific size required. 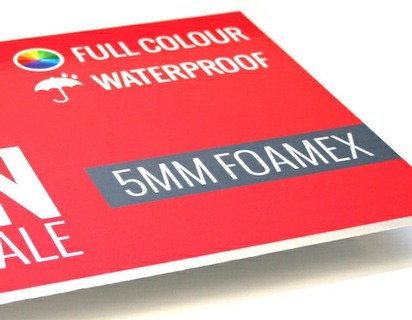 *Foamex is available in 1mm, 2mm, 3mm, 5mm and 10mm thickness. *Correx is available in 4mm and 6mm thickness. *Foamex prices include gloss or matt lamination.